AFC Bournemouth manager Eddie Howe has spoken following today’s victory against Brighton & Hove Albion. 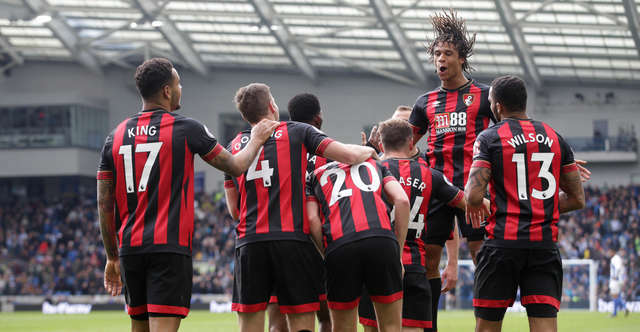 Goals from Dan Gosling, Ryan Fraser, David Brooks, Callum Wilson and Junior Stanislas sealed the three points, which saw the Cherries record their biggest ever away win in the Premier League. A red card for Anthony Knockaert saw the hosts down to ten men, but it was the Cherries who left the Amex Stadium with maximum points. I’m really really pleased with the performance today. It’s been a difficult run and we know the importance of today’s win. Once we got the first goal, I saw a different us. We were more confident, a cohesive unit and it was a much improved second half. It was a late challenge, but I don’t think he [Anthony Knockaert] meant to hurt Adam [Smith]. Thankfully, he seems fine and from that moment our mentality was excellent and it was an enjoyable end to the game. Adam’s got that mentality to get back up and keep going. He’s been a big miss for us with his injuries this year, but today he produced a really good performance. 40 points is a nice place to be. It’s been a frustrating second half of the season after we started the campaign so well. It didn’t quite materialise as we would’ve liked, we’ve been stretched with injuries and it’s halted our progress but we came through it and we now want to finish the season on a high. Our goals today were trademark us, which was the pleasing thing. The first goal was a great team goal and it was nice to see Dan [Gosling] score. In the second half, we gelled and linked up well around the box so I’ll enjoy watching the goals back later tonight.